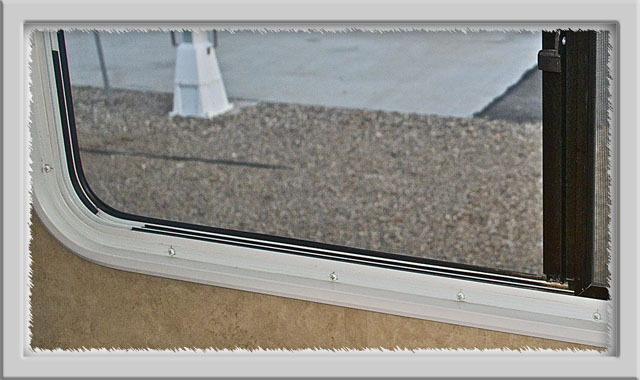 Double glazing for our RV was a fairly simple but extremely effective and economical way to both keep our fifth wheel warm and to reduce excessive use of our furnace and electric heater. Double glazing works by maintaining a stationary layer of air between two surfaces (glass). Heat is motion in molecules–the hotter a material is, the faster its molecules move. When excited molecules bang into nearby molecules, they spread the heat. This is called conduction. Because air molecules are spread out, they do not conduct nearly as well as a solid like gas. As a result, the trapped air acts as an insulator. Some heat can still flow through the air, but it moves much more slowly than it does through glass. 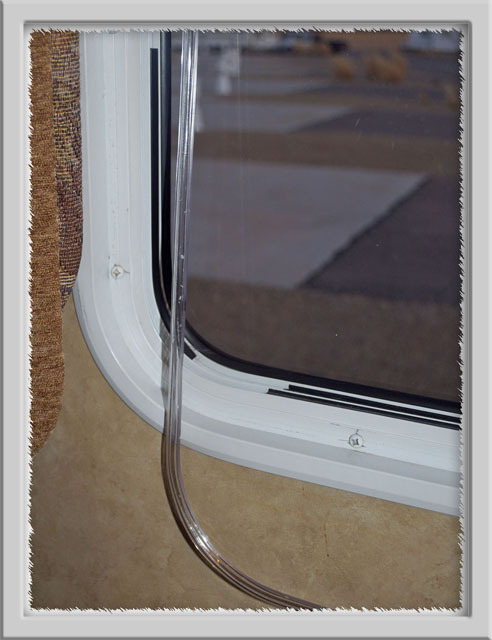 In an RV, in winter, it’s not a matter of the cold coming in but of the heat going out. Lose your heat and you turn on the furnace and make some more warmth. As fast as your furnace makes the heat, it moves out through the uninsulated areas (ie, windows). 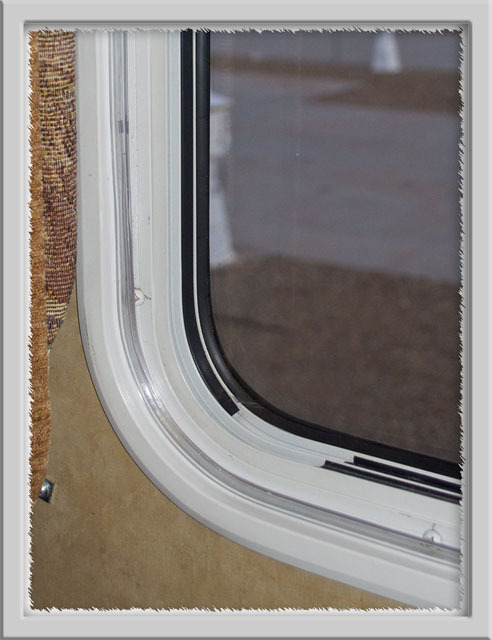 The windows in my fifth wheel and, I’m sure, most RVs are manufactured in such a way as to make it fairly easy to add a second layer of glass (or acrylic) to the inside of the aluminum framework of the window, as shown in the picture below of a typical RV window. You can see from the above pictures that the process is little more than accurate cutting of the acrylic material, rounding its corners to suit my existing window corners and making a long cut line in some clear tubing which is subsequently pressed over and around the perimeter of each finished sheet. The rest of the job is only complicated by the need to work out which sizes of acrylic sheeting to order to minimise wastage. That’s where the use of the graph paper greatly assisted me as I will explain later. That old adage is so useful to builders and carpenters (my background) and works well for all kinds of home handyman projects, especially if they involve picking up a tape measure. The adage implies to think carefully and really understand the dynamics of what you are about to do. Then apply the tape measure to the job and double check one’s numbers. Then transfer those measurements to the material and double check again – especially for me as I wear glasses….and then time for that one cut. As if all the above were not enough, America still holds on to the original English system of Yards, Feet, inches and fractions of an inch and that last part of that system, fractions of and inch, is where the measuring often goes haywire.The European system of metrication threw out the hereditary English king’s foot, which, some say, was the basis for the system, and replaced it with one Metre (meter). Divide one metre by 1000 and you have millemeters – multiply by 1000 and you have one Kilometre. Sounds complicated until you start using it! 5 yards, 2 feet, 7 inches + 9/16″ = 5374mm …. Hmmmmm! Still need convincing? Multiply each side of the foregone equation by 100 and then re-write the equation…using a timer. Build a box 1 mtr x 1 mtr x 1 mtr , fill it with water and weigh the contents….1 metric tonne. Divide the contents by 1000 and you have 1 kilogram(weight) and 1 litre (bottle of coke! )…continue dividing and you come to grams, millegrams…..don’t do it, just think about it (think thrice). Having lived and worked with both systems I have developed a preference….but I digress! We have spoken about the recess within the window frame and this is what I have to measure. 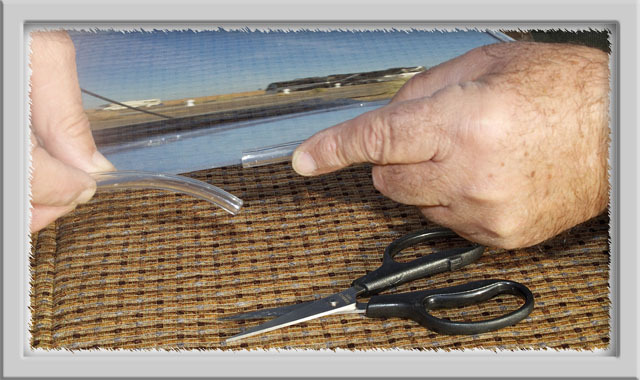 I also had to allow for the clear tubing which we will add to the cut edge of the acrylic. In effect this will add 1/16th” to each side and the top and bottom of the sheet which then will not fit into the recess (think thrice). Also, to give myself 1/16th” of leeway in measuring, I removed 3/16th” from each measurement. Final measurement 35 1/2″ X 21 1/2″…. Once again I double checked and moved on to the next window. At the end of this part of the job I had a list of measurements which need to be applied to the acrylic sheets. My list was for thirteen windows and I needed to make sure I wouldn’t waste money buying more acrylic than I needed – enter the graph paper. Let’s go get some graph paper from the internet! When the site came up there was a small online form in which you set the parameters of your graph paper. I left everything as was except the ‘Grid Spacing’, which I changed to 8. Now I click on “Download PDF’ and wait for the graph paper to appear on my screen. When it does, I print out several copies of the graph paper and then save it (to the desktop) for later use. 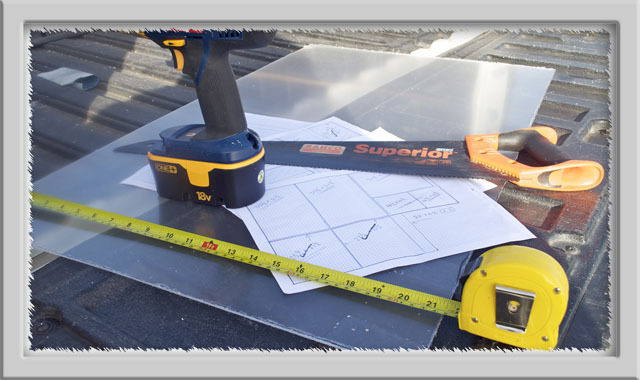 Since the largest sheet of acrylic is 6’ x 3’, the resultant graph paper will accommodate that size using the small squares as 1” intervals (72 squares X 36 squares). I then mark out a 6ft by 3ft box on the graph paper to represent the acrylic sheet. When finished, I put these graph papers aside. With more graph paper I marked out the 13 window box sizes with a red pen. Not forgetting to mark inside each box the actual window size and location ie. ‘Kitchen side window’ etc. 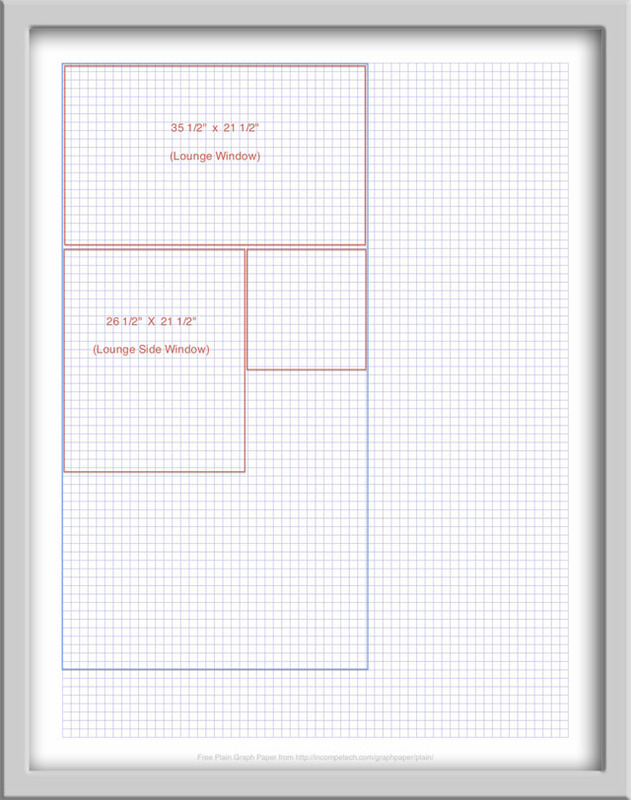 With a pair of scissors, I then cut out each window box drawn on the graph paper. Now it was just a matter of playing with the cutouts (windows) placing them on the various sheet sizes until I achieved an economical use of the sheets available. Using a hand saw, index finger of my saw hand pointing along the top of the saw for control, left thumb to guide the initial cutting and to protect my hand. Using long slow strokes of the saw not short hurried ones and keeping the angle of the saw close to the horizontal I was able to prevent fracturing the plastic. For the rounded corners I went through the kitchen cupboard and found a 6″ soup bowl which was exactly the correct radius (I’m not kidding). I then applied said soup bowl carefully to each corner and ran a felt tip pen around the radius onto the sheets. 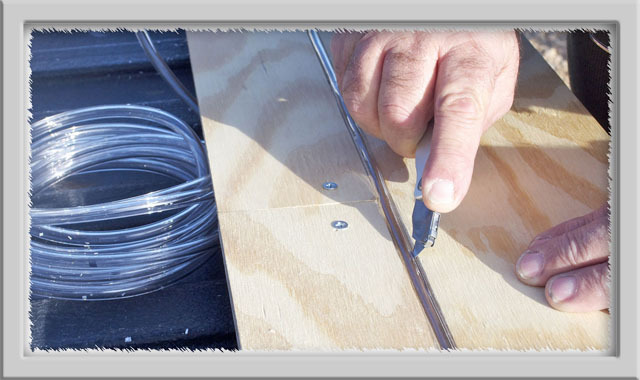 Installing clear tubing around perimeter of glaze. Well, that’s about it. My 13 windows Cost me around $300.00 including tubing, sandpaper and acrylic sheets. The result was a warmer fifth wheel by far! I know that double glazing works both ways so I expect my efforts to be rewarded also when the hot weather kicks in and I turn on my AC unit – double glazing will also keep the heat out on the outside of the fifth wheel! If the weather is either hot or cold I would not open a window but, the glazings just slip out if you need more fresh air than just opening the door or the roof vents.